Sticks and stones may break your bones when there's anger to impart. Spiteful words can hurt your feelings but silence breaks your heart. Anger is as a stone cast into a wasp's nest. [24 Aug: Don't live underground? I beg to differ. And please pass me the scotch and the anesthetic spray again. My experience suggests that if you leave the biting, stinging things alone, they'll leave you alone. So when I mowed the lawn just before going on vacation and got stung by a couple of wasps, I figured I drove my lawn mower over their nest, they were entitled to be a little grumpy. Besides which, I was way off in the far corner of the yard and if the wasps wanted that corner, they could have it. This afternoon, Ralphie wanted to irrigate one of the pine trees, so we went strolling into the back yard. 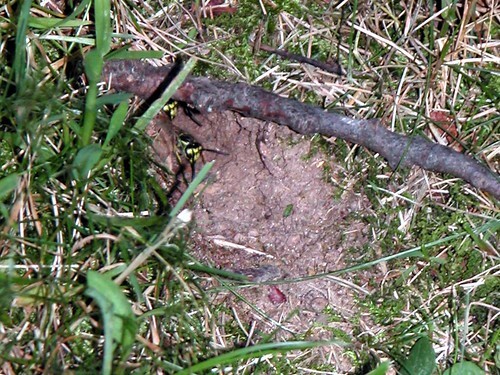 I can only imagine that there's another burrow somewhere near the middle of the yard because the little buggers got me seven times, once on the face, before I could dash into the house, dragging pour Ralphie behind me, and crush the little bastards. I have not been so aggressively attacked by wasps since I kicked over a nest when I was about seven (but that's a whole different story). The back yard is mine. I'm willing to share, but at this point, I think one of us is going to have to go. It ain't gonna be me. Now, if you'll pardon me, there's a scotch and some anesthetic spray with my name on it waiting in the other room. A landscaper tells me that you should more than a third of it in a pass, so if it gets too long you may need to mow on high, wait a day or two, mow on medium, wait and then finish it. Depending, of course, on the length you want it to be. I have read several comments about these ground wasps but can't find a way to get rid of them!!!! I spray wasp and hornet spray and they just fly through it. I sprayed a whole can of spray in their nest (on my lawn) and they just kept on going!!! Can someone please tell me how to rid our lawn of these stinging annoying pests!!! For what it's worth, a local exterminator was able to kill them off with the application of some putatively not too toxic compound.